The Idun left Koblenz at 4 am bound for Cologne. Last night we had been told that while none of our remaining tours would be affected, we would have to spend all day ashore on Friday as the ship needed to go in to dry dock for two hours. We began to speculate what had happened during the trip to cause this dry docking, but we were reassured it was a minor procedure. We were not convinced but also not worried at all. During breakfast this morning we were able to watch the approach to Cologne as the ship motored gently downstream. Traffic on the river increased markedly, Barge after barge passing by fully convinced us that this river must surely be the world’s busiest. Out ship docked beautifully, smoothly, about three blocks from the wonderful cathedral. We had been to the city and seen the cathedral in ’87-’88, but not from the river. This was Ascension Day and today is a holiday in Germany. We disembarked and met our guide who proved to be superb. A shower of rain was falling gently, the first rain to affect us on the trip. However, it wasn’t enough to deter us and off we went on a walking tour heading to the cathedral. 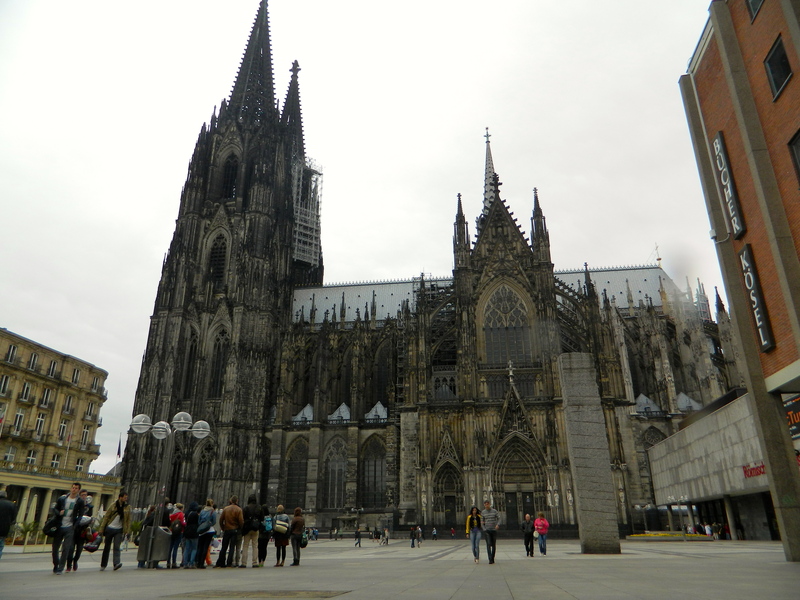 Our guide told us that the Dom (cathedral) had been started in 1248, when the city had about 50 000 inhabitants (Financially, that would have equated to a city of 10 000 000 today). It was said that the bones of the three wise men had been brought here from Italy, and this gave rise to the building of the cathedral as a home for these relics. 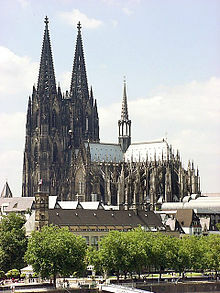 It took over 600 years (off and on) to build this fabulous cathedral and it was finished by using the original plans. Imagine how many generations helped build it. We strolled around the outside in the shower as a service was going on inside. Eventually tourists were allowed in as the service drew to an end. It was so wonderful to hear the choir singing and catch the last part of the prayers. Our guide pointed out to us a replica of one of the finials on the top of the cathedral. It was over 30 feet high and weighed Lord only knows how many tons. It is hard to imagine the craftsmen hoisting this to the top of the cathedral. When we came out, it was time to head back to the ship. As Cynthia and I made our way slowly back to the ship, we tried to cut across a courtyard of red bricks. We were asked gently by a city worker, to detour around the red brick area. We noticed signs posted around the area. 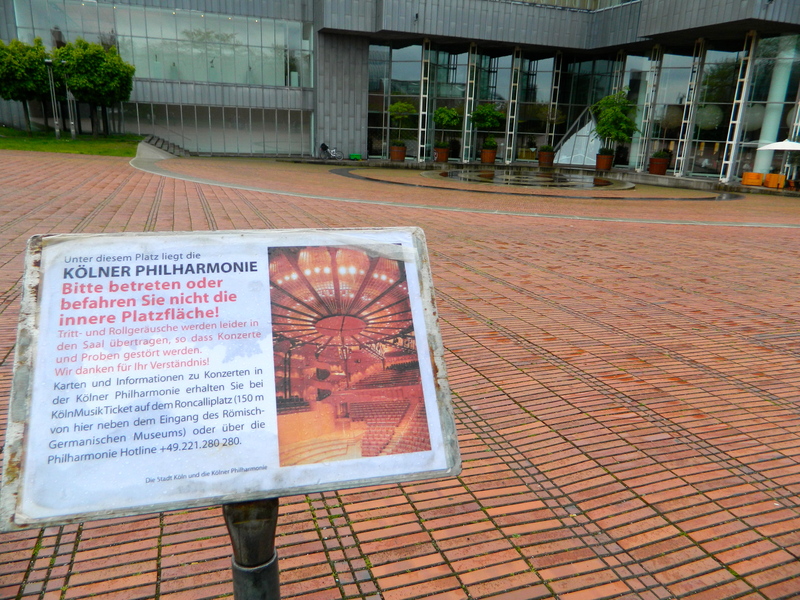 They stated that the Cologne Philharmonic orchestra was in a recording session beneath our feet. 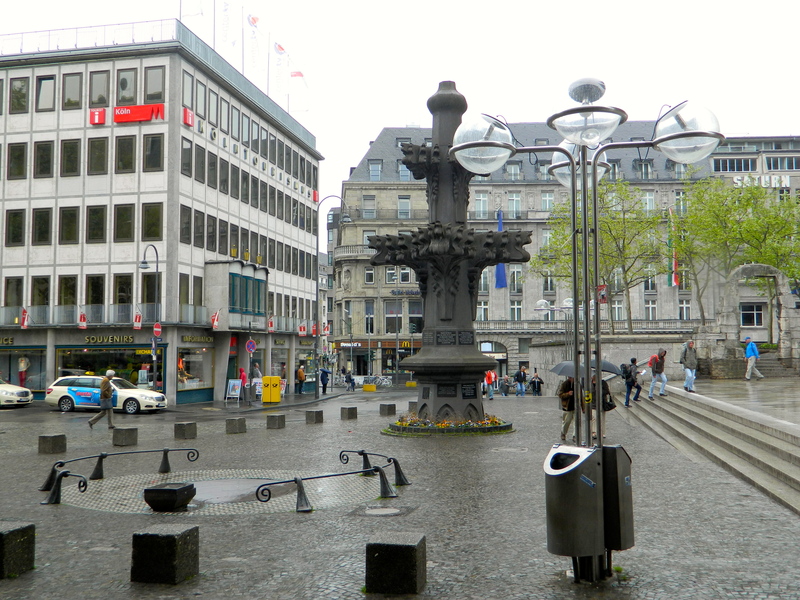 The red brick area was the roof of the Cologne concert hall! We had learned so much about this city in such a short time. Like other places on this trip our appetite to re-visit had been increased. We relaxed through the afternoon and watched the people come and go on the dockside. Cyclists mingled with pedestrians and children rode their scooters. It seemed the whole city was out and about, enjoying life on this Ascension Day. At 6.15 pm we had our daily briefing in the lounge. 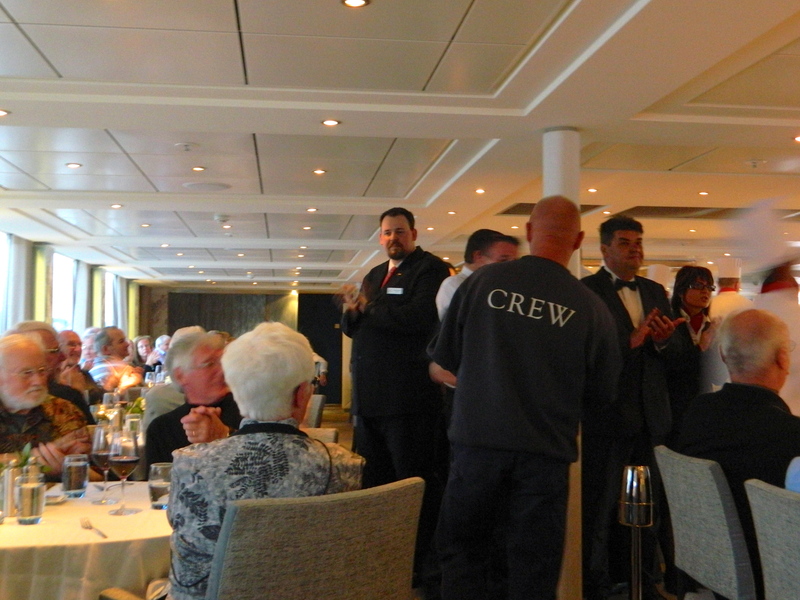 That was followed by the Captain’s reception and after that we were asked to join the skipper and Gerhardt the hotel manager at their table for dinner. Woowee…Harringtons and Davies had hit the big-time…not! 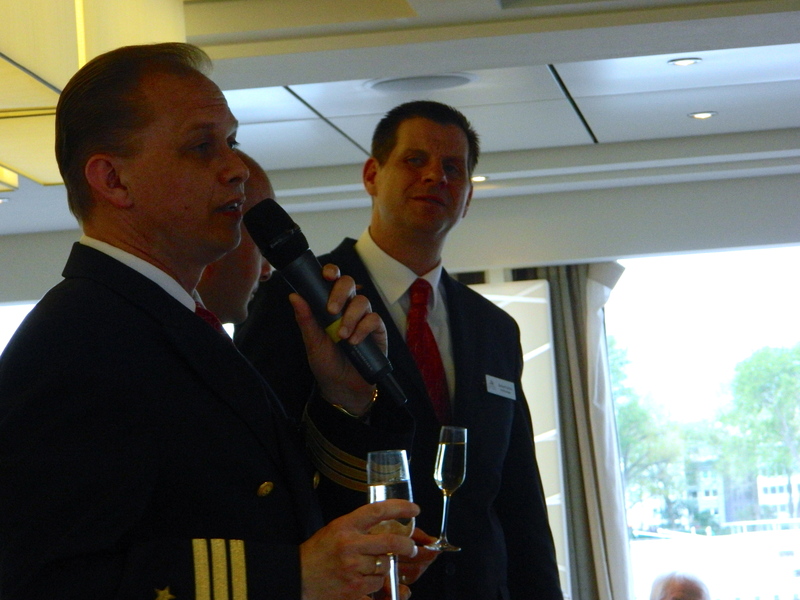 The dinner with Harringtons, Captain Igor and Gerhardt proved to be a very pleasant experience and Gerhardt looked after us very well. I know Don felt it was a little over the top the way we had three waiters and the Maitre D hovering around us, and I agree with that completely. However, they absolutely spoiled us. Tomorrow we head downriver and dock in Rotterdam. One full day excursion remains and that’s that. I don’t know if it will be possible to post anything regarding this last day’s excursion before we get home. I will try, but…if not…thanks for coming along for the ride and for your support and comments. Our time in Europe is fast growing short. Goodbye for now and God bless. We had a leisurely breakfast as there was nothing major scheduled for the morning. The ship had left Nuremberg last night en route for Bamberg, and continued travel along the canal. However, we had been told that due to a major event, a huge marathon run, happening in Bamberg, we would not be able to dock at the scheduled place or do the scheduled activities. This was indeed a shame, for Bamberg was one of the few cities in Germany not destroyed by allied bombings. As such it is the largest old town in Germany to retain its medieval structures. Because of this, it was named a UNESCO world heritage site in 1993. It was a shame we were not able to see it, but it gives us one more reason to come back to this gorgeous part of Germany. Instead of a tour of this old medieval city, we would now be shown the Seehoff Palace, just outside the city. At 10.30 our cruise director Vlad informed us of a trivia contest happening in the lounge, so we, Don and Lynore mosied up to take a peek. 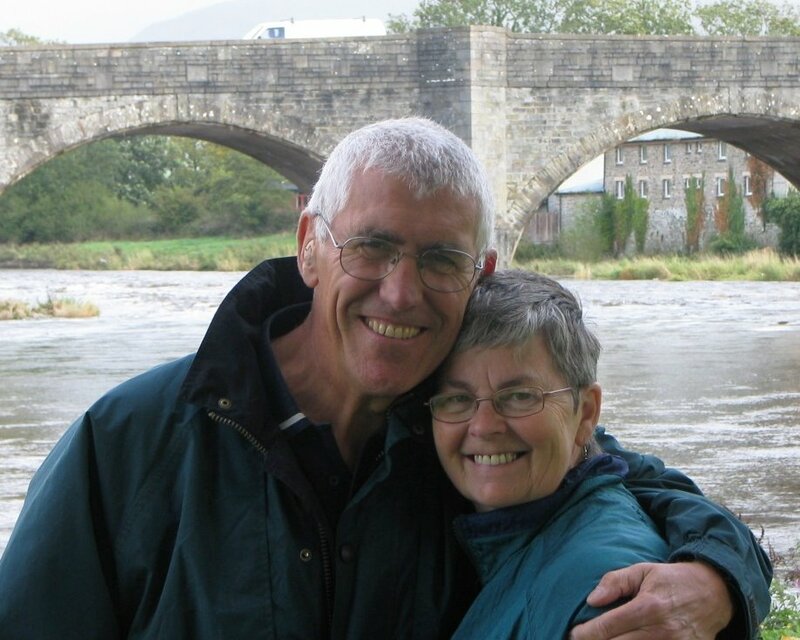 Along with Gloria, our naturopath friend from Seattle, we formed a formidable team. Winners of the contest would be informed at the briefing tonight and presented with their liquid prize. More on that later. About 11.45 the Idun docked near a huge pile of scrap metal on a dock in downtown Bamberg. It was to be our temporary docking place. We had lunch then boarded the buses at 1.30 pm. 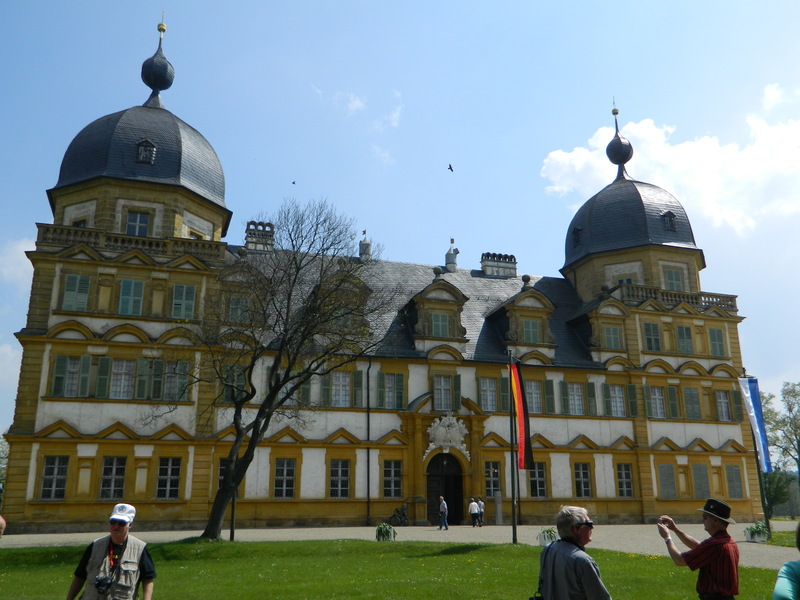 We were off to visit Seehoff Palace, a beautiful country home just outside the town of Bamberg. At the same time that we boarded the buses, the ship left its moorings for Hassfurt where it would wait until we re-boarded later in the day. The ride to the palace was a short one. The entry to the pace was impressive as the palace (really a very large country home) sat on a rise and we looked up to it as we entered the grounds. Seehoff Palace From The Entrance. Because of the restructuring of the tour, our guid ‘fessed up that she new little about this place. We appreciated that, and as such, she was asked no awkward questions by the group. 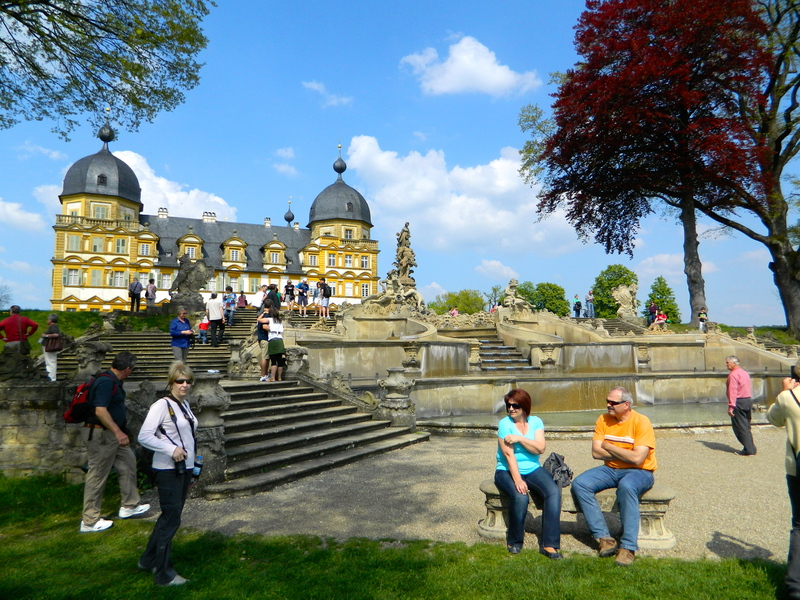 However, what she did, (and this was no mean feat) was to translate from German to English, what the local guide told us. We toured the house and it was very lovely. 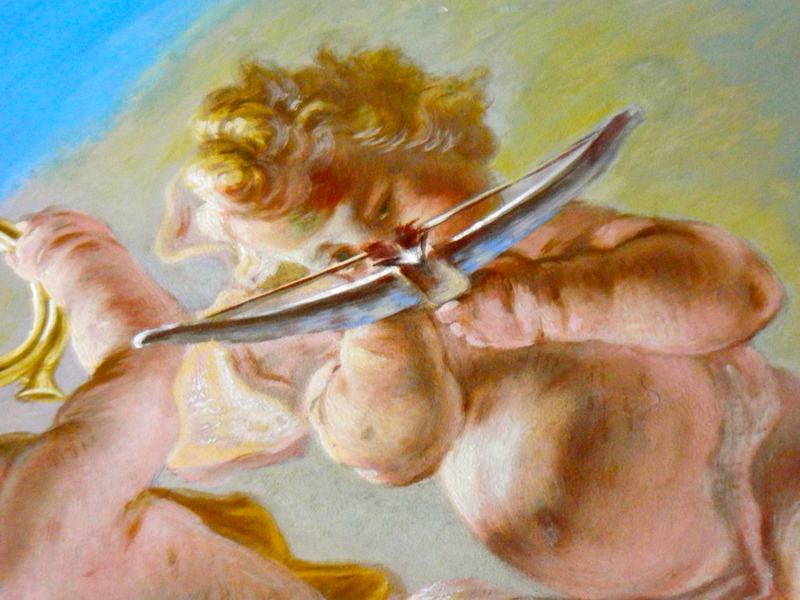 I especially liked a little angel painted on the ceiling of what must have been the ballroom. He was shooting an arrow from a bow. No matter from which point in the room you viewed him, he was always pointing his arrow at you. Basically, the history of this place was it was built as a country retreat by some rich folk, who lost their fortunes and had to sell the house. Later, they regained their wealth and re-purchased their home to take care of it and install the gorgeous gardens for which the place became famous. Sadly, the gardens are no longer here but acres of grass and parkland. Our guide toured us around the grounds and did he best to give us as much info as she had been able to muster since hearing about her changed tour venue. At four pm we were all taken to the large fountain which erupted right at four with water going everywhere. It was a good sight, but Bellagios it was not. Befoer the bus left, we managed to squeeze in an ice-ream at the cafeteria. The treat was lovely but the seat was even more welcome. At 5.30 our bus left for the ship and we boarded. As we headed in for dinner later on, we were told that there was abig problem with the air-conditioning on the ship but they were working on it. After a hot dinner, in more ways than one, we headed for our rooms and crashed! Yet another good day was had by all in spite of the changes. Tomorrow we dock at Wurzburg. Goodbye for now and God bless. When we woke this morning the sky was grey and overcast. However, we still believe the sun will burn through by sometime later in the day. Passage through a series of locks in the night had kept Cynthia awake for periods of time. I didn’t feel or hear a thing. Being hard of hearing sometimes has its advantages. We joined Don and Lynore for breakfast at 8 am and Don summarised this day nicely, as being a”soft” one. In half an hour, at 9.30, Vlad, our cruise director will give us a little talk on Germany. 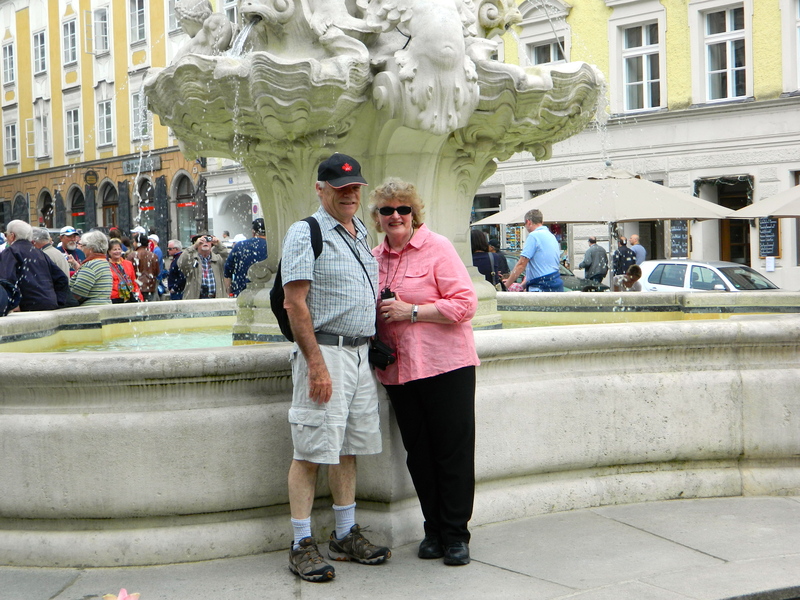 We then dock at Passau soon after and have a walking tour of parts of the town until close to noon This also includes an organ recital in St. Stephan’s cathedral. Then we get back to the ship for lunch and cruise some more to another smaller town called Vilshofen. 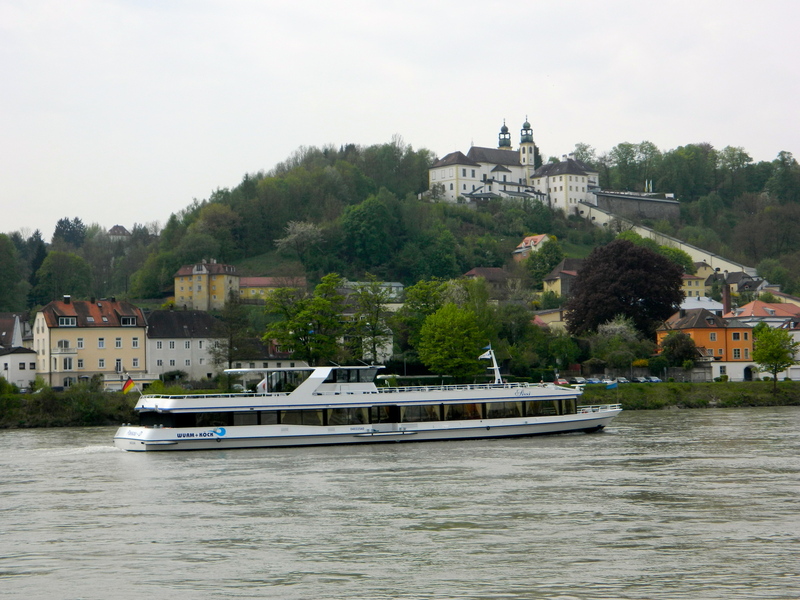 Those who wish to stay longer in Passau can do so for a bus will take them on to Vilshofen where they can re-join the ship. Finally, around 6.30 pm, the ship sets off for the next major stop at Regensburg. Those are the plans.. more later on how things actually pan out. It’s 2 pm now as I continue. Our walking tour was a success, only marred by Cynthia not being with us. She’d had a tough night with little sleep, so she decided to stay put to rest. 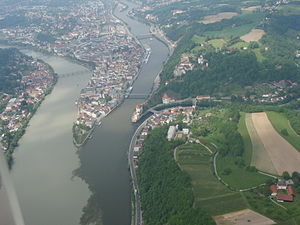 Passau is situated at the confluence of three rivers, the Inn, Ilz and the Danube. In the picture below the Inn comes from the left. The Danube is centred and the Ilz is the small one which comes from the right. 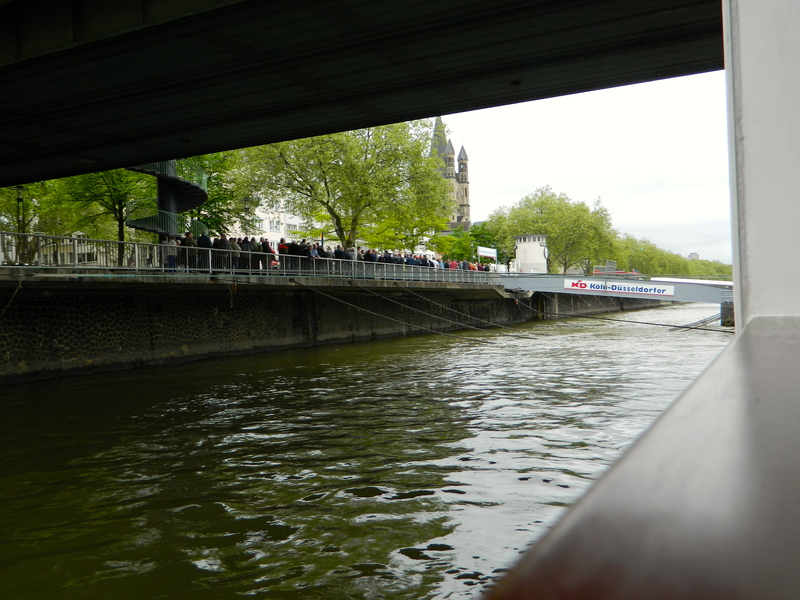 Our guide took us along the bank of the river Inn, up through a narrow alley and into the Cathedral square. 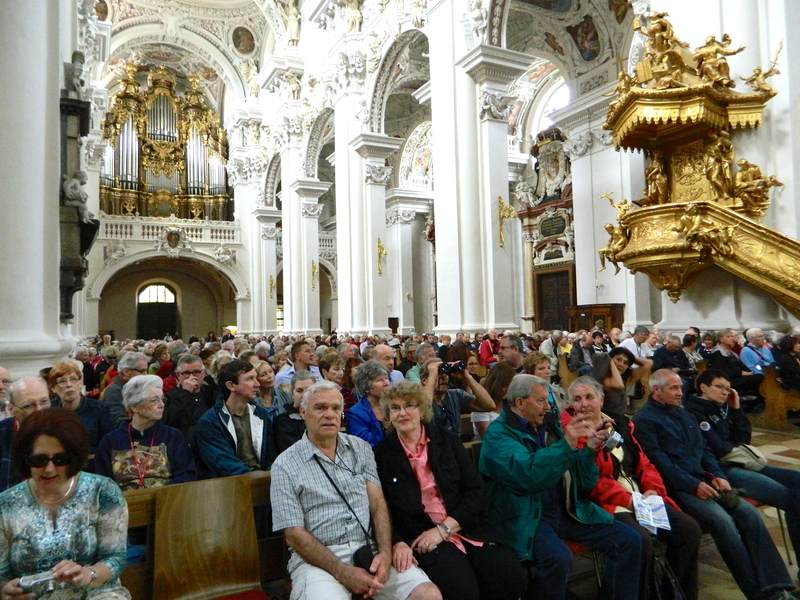 We arrived at the rear of St. Stephan’s and walked around the front to enter. Entering this massive cathedral is a breathtaking experience. Not only is the cathedral in great shape, but there must have been a thousand plus people in there, all comfortably seated waiting for the commencement of the organ recital…and what an organ to be sure! 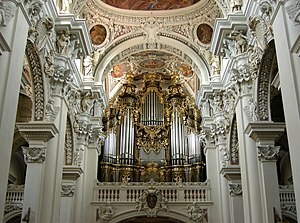 It is the largest cathedral organ in the world, and the second largest pipe organ in the world. It has 17 774 pipes, 233 stops, and four carillons. All five parts of the organ can be played from the main keyboard, one at a time or all together, offering the visitor an unforgettable acoustical delight. We were in front row seats with the organ as far to the rear of us as possible, yet, due to pipes located at the high altar area, we heard the sound in stereo. It was magical. When the concert ended, we made our way downhill, back to the boat. You’d be forgiven for thinking you were in Italy, for this historic old centre has a definite air of Italy, with it’s jumble of winding, cobbled lanes, underpasses and archways leading off the main streets. At 3.30 the ship moved on up the Danube to Vilshofen to pick up those who had extended time ashore, and then headed off to Regensburg.